In March of 2012, we finally got a dog. Even though I grew up with dogs, having a dog as an adult has been an entirely different experience. First of all, I got to name her. I'm an opera singer, and Puccini is my favorite opera composer. My bathroom is decorated in vintage Puccini opera posters, I could listen to Puccini all day, and my favorite arias to sing are written by Puccini. I always thought it would be so fun to name a dog Puccini. Not only would it be an homage to my favorite composer, it would be a cute play on words: Pooch-ini. 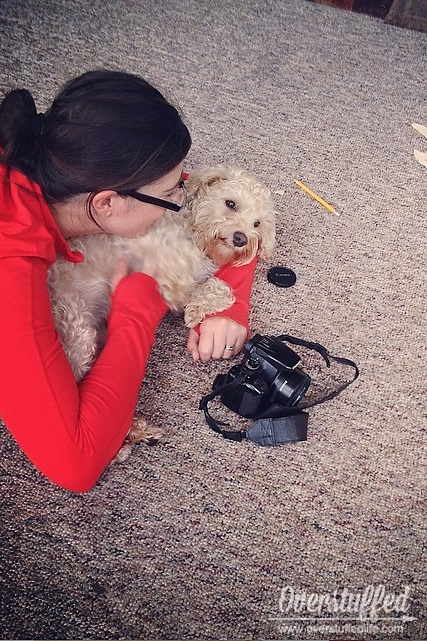 When we got our little schnoodle puppy, it was obvious that her name needed to be Pooch. I mean, just look at that adorable puppy photo below! She is the epitome of the word pooch. Puccini was the perfect name for her. This was solidified for me a week or so later when I took her on her very first walk down by the waterfront. Two people passing by us both said "Hi Pooch!" to her, and I knew we had chosen the right name for her. I love my little dog so much, and I treasure the relationship she has with my family. Puccini has truly become a member of our household and has taught me more than a few things about life. If I could live a little more like a dog, I think I'd be doing pretty darn well. She understands the important things in life a lot better than I do, that's for sure! 1. If you need a hug, ask for it. Every morning, Puccini lets us know she is ready for her morning snuggles by pawing at our arms and faces. If we stop scratching her back before she is ready, she paws again. Sometimes, during the day she sticks her nose under my hand (no matter what my hand is currently doing) and lets me know she needs a good scratch behind the ears. Puccini demanding affection from me while I was trying to photograph something for my blog. Sometimes I really need love and hugs, too. But I'm not very bold about asking for them. Instead, I sit around feeling unloved and uncomforted when I could just tell my husband or my kids that I could really use a hug right now. Take a lesson from Pucci, if you need to connect with someone, tell them so! Ask for hugs. 2. Exercise is the best part of the day. As soon as we're outside, she practically drags me up the hill in her happiness for being outside. I hate exercise, and only do it begrudgingly. Doing it with my dog, who is just so happy to be moving her body, makes it a little bit fun. Sometimes I even run with her for (very) short spurts, which sends her over the moon with joy. She knows something I don't, obviously. Exercise is important and should be eagerly anticipated. 3. Friends are awesome, but family is the awesomest. Puccini has many friends. Some of them are other dogs and some of them are favorite humans. She greets all of her beloved friends with equal enthusiasm, thoroughly unable to contain her happiness (in more ways than one, unfortunately—Puccini does not have the strongest of bladders when she is happy!). But if a member of the family comes home—even if they had just stepped outside to get the mail—her happiness at their return is ten times the happiness she shows when a friend visits. Happiness is really the wrong word here, more like sheer ecstasy. And lots of happy pee. She knows the general time the school bus brings her sisters home each day and right around 3:00 she takes up a vigilant perch at the window watching for them. Sometimes I walk up to the bus stop with her instead and the happy reunion every single afternoon is wonderful to see. I'm working on greeting my friends and family a little more enthusiastically. Even if I don't pee myself or jump up and down in joy, I want them to know that I am genuinely happy to see them and even happier to have them in my life. Puccini values her sleep. I should, but I am a night owl to the core and my life requires me to get up earlier than I'd like. Sleep is always taking a back burner in my life. My dog does her best to get me to bed earlier, though. If I am working on my computer when she is ready to go to bed, she comes and sits at my feet and makes a low rumbly noise in the back of her throat. It's not a growl, exactly, but it's her way of letting me know she wants something from me (sometimes it's food, for instance). When she does this at night, she is telling me it is time to go to bed already! If I ignore her, she eventually gives up and goes to my bedroom, hops on the bed, and proceeds to bark at me to come join her. If I still don't come, she lets out an annoyed sigh, makes her nest, and goes to sleep without me. If that weren't enough, she makes sure to get several naps in each day, as well. If I actually decide to get in bed and take a nap, she takes a running leap to the bed and cuddles with me the whole time. She loves her nap time! 5. Keep on chasing your dreams, no matter how many times you fail. 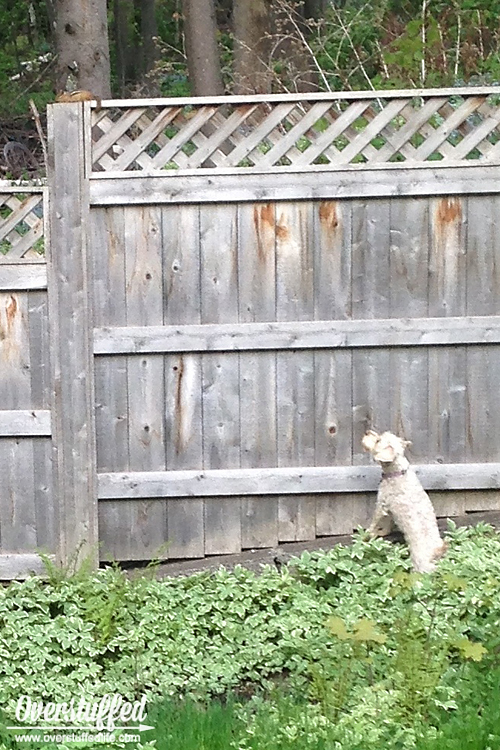 Puccini would love nothing more than to catch a squirrel or a chipmunk. She has ample opportunity to try, but the closest she's come is chasing a chipmunk into the house and cornering it behind the fridge (that was fun). She doesn't let the fact that she has never actually caught a small animal get her down. She doesn't let the fact that her chipmunk catching skills are pretty poor keep her from trying again. 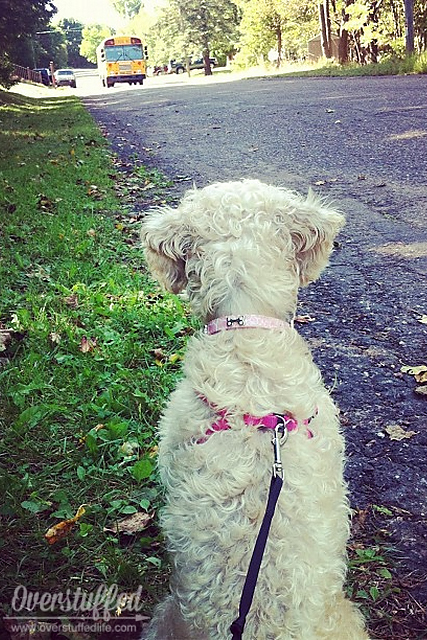 She really wants to catch a chipmunk, and by golly, she's going to keep trying until she does. And then she'll keep trying until she catches another one. How many times have I given up on something after multiple failures? Too many times. Time to dust off those dreams and keep on chasing! How did your dog get its name? 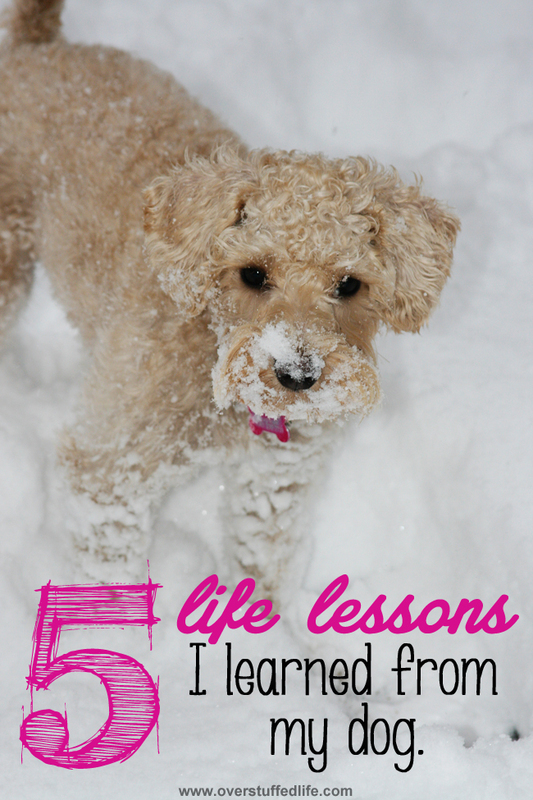 What life lessons has your dog taught you? Great post! Very cute stories. I have cats, not dogs (yet), but I love how much they enrich our lives and bring so much extra personality to our house. I love the way you think about what you can learn from them. While we do not currently have a dog, we do have cats that we adore. We rescued them from the Humane Society. Our big fluffy sweetheart is named Reeses, because she is a Tortie and looks like peanut butter and chocolate mixed together. Our polydactyl kitty is named Tootise because she has 6 toes on each of her paws. She is a tiny kitty with huge feet. Our big boy is name Milo. They had named him Paws at the H.S. but it did not seem to fit, we changed his name to Milo from the movie Milo and Otis. I love your dog's name! My dog is Nacho Bell Grande. He's a chihuahua and looks like the Taco Bell dog. He was nameless for a week, but when I said I started craving nachos Bell Grande every time I looked at him, it stuck! Sounds like your sweet pup has the right priorities. Such a special member of the family. Thanks for sharing. Better yet, carve your own signature stamps and maintain the best practices of a centuries-old activity. It's not that hard. Use white erasers if you can't find carving medium. It's always a bit of a disappointment to find one's letterboxing log full of the impressions of commercially produced stamps. The art is part of the point! Do you call him Nacho? I love that name, and he's adorable! Dog welcomes are the best! Peppy is a great name. I love hearing how people choose names for their pets. They do. Our house feels so empty whenever she's gone for some reason! She's definitely a member of the family. Love the names you've chosen for your kitties and the way you chose them. She really does. If I could figure out the sleep thing, I'd be happy!